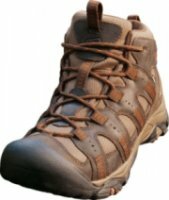 Scarpa Kailash GTX - The award-winning Scarpa Kailash GTX Hiking Boot is back again with a revamped build and a vengeance for tearing up any trail. A brand new sole package highlights this model as it beefs up support and structure so that you are able to handle whatever your trek throws at you. Bi-directional ankle flex is yet another feature that is focused on fueling your adventure. It provides unparalleled mobility while never sacrificing stability. 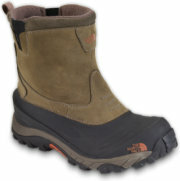 The North Face Back-To-Berkeley Boot - The North Face Men's Back-To-Berkeley Boot. This warm-weather, low-cut version of the Back-to-Berkeley boot combines an old-school look with new-school tech. FEATURES of The North Face Men's Back-To-Berkeley Boot. 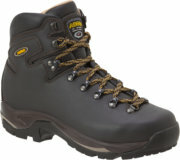 SPECIFICATIONS of The North Face Men's Back-To-Berkeley Boot. PU-coated, ballistic polyester upperOrtholite sockliner and EVA midsole cradle your foot in comfortDie-cut EVA midsoleHydroSeal waterproof membraneWaterproof suede mudguardTacky Winter Grip rubber and temperature-sensitive Ice-Pick lugs help you keep your footing on the iciest surfacesDurable TNF Winter Grip rubber outsole with IcePick temperature-sensitive lugsGusseted tongue keeps out debris. Keen Pittsburgh - Up your productivity with the KEEN Utility Pittsburgh work boot. 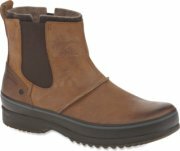 This rugged men's ankle boot has a waterproof nubuck and synthetic upper with a generously padded tongue and collar and secure lace closure for a snug fit; rely on the Dri-Lex lining to help maintain a fresh interior. Exceptional comfort is offered by the dual-density, compression-molded EVA/polyurethane midsole, EVA heel cushion and removable, anatomically contoured EVA footbed. In addition to contributing ASTM-rated protection, the shape of the left and right steel toes allow for a roomier toe box. 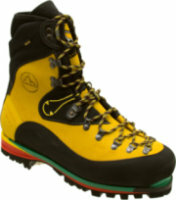 La Sportiva Spantik - The Mens Spantik Boot by La Sportiva is a technical lightweight double boot for cold environments. 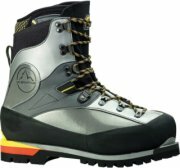 The cutting edge of mountain-boot technology, the Spantik (hint: it's a peak in the Karakoram Himal whose Golden Pillar is synonymous with extreme alpinism) combines all the latest, lightest materials to shave a full pound of the Nuptse and still offer unimpeachable climbing performance. Throw in the FLS (Fast Lacing System) and integral gaiter collar to keep spindrift out, and the summit is yours. Zamberlan 230 SH Crosser Plus GTX RR - Speed-walking is so '80s. 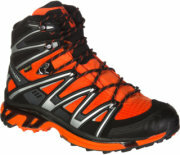 Go fast in the dirt with the Zamberlan Men's SH Crosser Plus GTX RR Hiking Boot. 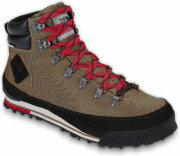 This lightweight, low hiker was made for speed and stability on rugged terrain. Its Gore-Tex Extended Comfort lining keeps your foot dry and cool when you're running hot and skipping through creeks. A Lycra tongue and perforated microfiber interior adds cushy comfort and keeps out debris. With lacing that starts at the toe, you get a precise, energy-efficient fit, so you're never spinning your wheels. Sorel Caribou - A timeless classic since their introduction in 1974, Sorel Caribou Boots have risen to iconic status in many parts of Canada and the northern United States. Their reputation is well-deserved. These rugged boots withstand deep snow, ice and temperatures well below zero. 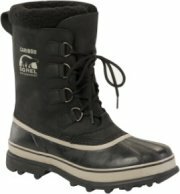 The Sorel Caribou is quality constructed with a nu-buck leather upper and vulcanized rubber shell, all seam sealed for complete water protection and durability. Sorel Caribou Boots feature a removable felt lining you can dry by the fire between uses, plus a Sherpa Pile cuff for keeping out snow after a two-foot storm. 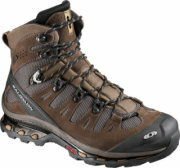 Salomon Wings Sky GTX 2 Hiking Boot - Salomon's Wings Sky GTX 2 Hiking Boot is the ultimate waterproof trail running boot for fast adventures in any terrain. Dual density EVA midsole with pronation controlOptimized fit for womenLycra collarNon-marking outsoleAnti-debris mesh upperSensifitSelf-locking eyeletProtective synthetic toe capWater resistant textileMud guardGussedted toongueSelflocking eyeletHell foamMolded EVA socklinerGusseted tongue. 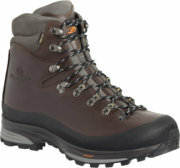 The North Face Back-To-Berkeley 68 - The North Face Men's Back-To-Berkeley 68 Boot. Throwback styling meets contemporary tech. With PrimaLoft Eco insulation, HydroSeal waterproof protection and IcePick lugs for winter traction, this ain't your grandpa's winter boot. FEATURES of The North Face Men's Back-To-Berkeley 68 Boot. SPECIFICATIONS of The North Face Men's Back-To-Berkeley 68 Boot. Die cut EVA midsole100g Prima Loft Eco insulationWeight pair based on size 9 - 2lbs 4oz/1010gCombined BLC-compliant waterproof nubuck and suede upperHydroSeal waterproof membraneSurable TNF Winter Grip rubber outsole with IcePick temperature sensitive lugsDurable metal lace hardwareOrthoLite socklinerGusseted tongueAWND. 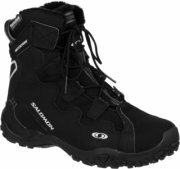 Salomon Snowtrip TS Boots - Salomon Snowtrip TS WP - Men's: Lace up the Salomon Snowtrip TS WP Winter Boot for anything from winter camping to taking your dog out to romp in freshly fallen snow. The burly Contagrip outsole helps make sure you stay upright over icy terrain while Thinsulate insulation keeps your feet toasty warm in even the most bitter temperatures. The Snowtrip TS WP Winter Boot’s waterproof membrane blocks snow and water from creeping in so that you’ll only head inside and take these Salomon boots off when you’re good and ready—and not because your winter boots couldn’t hack the cold. 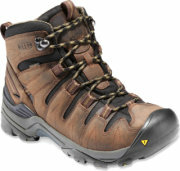 Keen Gypsum Mid - Meet every trail head-on with the KEEN Gypsum Mid hiking boot. 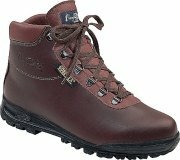 Built to provide support and protection from the elements during a wide range of outdoor expeditions, this men's trail boot has a waterproof nubuck and textile upper, padded tongue and collar and grippy lace closure for a secure fit at the ankle. An ESS shank adds support from below and an external stabilizer supports the heel. The ultra-comfortable EVA insole can be replaced with an orthotic for the ultimate in personalization. Keen Siskiyou Mid WP - Great for exploring canyons, dunes, trails and towns, the Keen® Siskiyou Mid WP features a mid-ankle height that provides added support and a waterproof membrane that's got you covered from puddles to streams. Waterproof nubuck leather and breathable mesh upper. Features KEEN® Patented Toe Protection where the shoe outsole wraps up and over the toes for ultimate protection. Moisture-wicking textile lining. KEEN. DRY™ waterproof breathable membrane that lets vapor out without letting water in. La Sportiva Batura 2.0 GTX - If you are looking for that lightweight boot for higher elevation climbs, then look no further since La Sportiva Batura 2.0 GTX is in town. 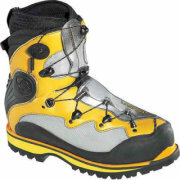 This men’s mountaineering boot uses the latest in two layer Gore® technology. 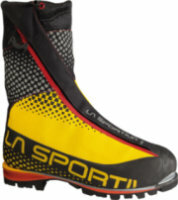 La Sportiva has created an integrated external gaiter with an asymmetrical zipper using the stretch Gore® that keep you dry on the outside, and an inner boot that uses another Gore® layer that pushes moisture to the outer layer. Ugg Stoneman - The All-New UGG Stoneman Boots are rooted in UGG's heritage, offering a rugged collection with a modern, hip feeling. The Stoneman was created with extra time by UGG to make sure the materials were perfect. Features a rich oiled full grain leather, twinface shearling and suedes make this a special boot. The full grain leather and suede has been waterproofed which is appropriate for the essential fall/winter collection. The insole of the Stoneman features UGG's iconic shearling that adds warmth, comfort and natural moisture wicking to the collection. Clarks Desert Boot - Roaming city streets or the outback, the Clarks Desert Boot is adaptable enough to get your there in comfort. 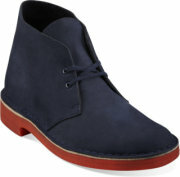 The plantation crepe outsole of this men's ankle boot cushions the foot and buffers shock. Suede lines the heel to ensure a snug fit and prevent slipping. Offered in a variety of upper materials, the Clarks Desert Boot is finished with traditional lace entry. Foam footbed is soft and cushioned so it improves overall comfort underfootNatural crepe outsole for cushioning and tractionNatural crepe outsole provides long lasting wearLace-up style provides an adjustable fitLeather liningSuede-lined counter promotes heel stability. Ugg Hartsville - For the ruggedly casual male, the 'Hartsville' from UGG Australia awaits. Handsome boot boasts a genuine twin-faced water-resistant sheepskin shaft with a waterproof leather upper. Durable molded rubber outsole for a sure step wherever you may venture. Interchangeable insoles, one leather and one sheepskin, for personalized wear. Convenient pull-on tab at the top of the back shaft aids in on and off..
La Sportiva Nepal EVO GTX - When it comes to leather mountaineering boots, it doesn’t get any better than the La Sportiva Nepal Evo GTX. No hunk of earth, no matter how massive, may stand in your way when you lace up these beasts. Mother Nature can throw her worst your way, but you can shrug it all off with ease knowing that nothing but the most advanced technology and the finest materials went into crafting this boot. 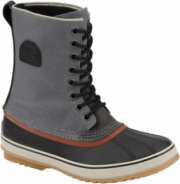 Sorel Ellesmere Boots - Enjoy the convenience of a pull on boot with the Sorel Ellesmere Boot. Your feet will stay warm and dry in the waterproof leather upper and rubber outsoles and the tough rubber sidewalls offer increased protection on wet days. The removable molded PU footbed gives you added comfort with heel cups and arch support. The rubber outsoles with a herringbone design give you plenty of traction when trudging through slush and snow.